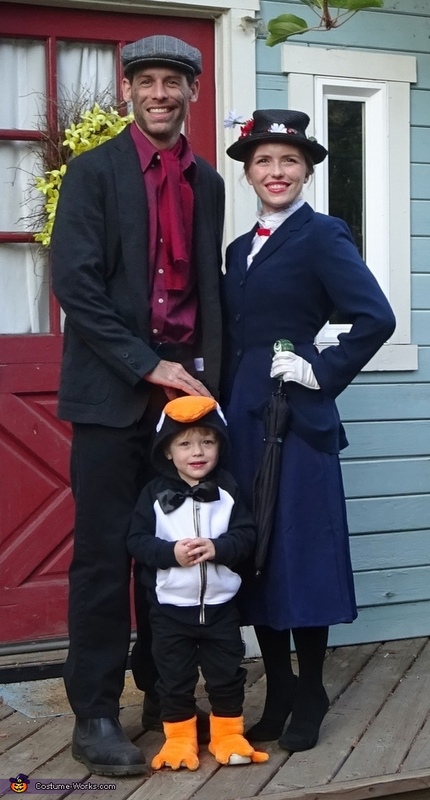 My two and a half year old son loves the penguin waiters in the "Jolly Holiday" scene of Mary Poppins and my husband was a chimney sweep for Halloween when he was little, so this was kind of a full circle family costume for us. Most of the Mary and Bert costumes are just altered thrift store clothing (with the exception of an authentic Mary Poppins umbrella courtesy of a Disney-loving co-worker). The penguin waiter costume is a black zip-up hoodie and sweat pants with sewn-on fleece eyes, beak, and tummy, microfleece flippers made to velcro over his sneakers, and a detachable satin bow-tie. The most expensive thing we bought was actually the toddler sweat suit ($24.99), but he can definitely get away with rocking a penguin sweat suit (minus the bow tie and flippers)for the rest of the year. I even bought them a size up to stretch it out for as long as we can! He loved being a penguin and kids and adults alike seemed to get a kick out of our costumes. We got a lot of Cockney "Mary Poppins!" greetings and "papped" by a lot of smartphones- my husband joked that he guessed we were public domain now!